SevenUpLive 2.0 Preview from bar|none on Vimeo. Planet monome is getting to be an exciting place. The biggest news: SevenUpLive, an extraordinary original application that melds the monome as controller with a set of Live functions, is getting a major rebuild and Max for Live support. Mapping the buttons of the monome to a set of Live sonic magic, SevenUp transforms the monome – and Live – into an interactive compositional instrument, with looping, sequencing, and melodic and rhythmic manipulation. With Max for Live integration, that will also allow people writing Max patches for Ableton to use their work as modules, and the simple grid controls of the monome as the interface. MakingTheNoise, the artist behind the project, is himself a terrific performer. I got to play with him last week at Boston’s Enormous Room, and he’s a wonderful guy and inventive artist. We’re both presenting in New York, so expect more on this soon (see the end of the story). New monome kits, models: Okay, so you want the real thing, and you’re ready for a monome of your own. You have two ongoing opportunities from the source, in addition to the various emulators and DIY projects. Dogs not included (sadly). First, monome production by Brian Crabtree and Kelli Cain is getting rolling again. The grayscale sixty four has to be one of the prettiest of these I’ve seen yet. It’s US$500, but it’s also a domestically-produced, largely handmade beauty you may want to hang onto forever. There’s no preorder, but keep on the monome site in January if you want to buy one; I’m sure this will again sell out. But you can also get an even easier-to-build kit from the monome folks themselves. The students at NYU’s ITP program (a multi-disciplinary technology program in Manhattan) got a whole bunch of folks together, did a group buy on kits, and had more fun by putting them together with friends. Check out the growing Flickr pool for a sense of all the mayhem. Now, true, there are more would-be monome users in Manhattan than perhaps anywhere else on Earth, but the basic idea – make with friends – could absolutely be replicated. If you’re interested, I can see if there is a way we can help coordinate such endeavors here on CDM and with Noisepages – shout out in comments. If you’d like to meet the creator of SevenUp, hear more about grids and OSC, and hear music and discussion from the creator of the monome, you’ll absolutely want to mark your calendars for December 12 in New York. More details are coming; watch this space. 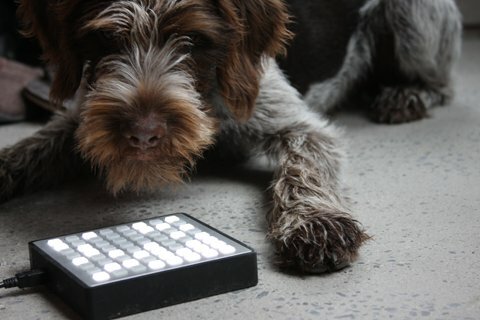 Got more monome news – or anything else? Do let us know. Artists We Love: edison is monome Instrumentalist; Look Ma, No Loops!